It’s another week with several on-topic installments of Frazz . Again, Jef Mallet, you and I live in the same metro area. Wave to me at the farmer’s market or something. I’m kind of able to talk to people in real life, if I can keep in view three different paths to escape and know two bathrooms to hide in. Horrock’s is great for that. Jef Mallet’s Frazz for the 22nd is a bit of wordplay. It’s built on the association between “negative” and “wrong”. And the confusing fact that multiplying a negative number by a negative number results in a positive number. It sounds like a trick. Still, negative numbers are tricky. The name connotes something that’s gone a bit wrong. It took time to understand what they were and how they should work. This weird multiplication rule follows from that. If we don’t suppose this to be true, then we break other ideas we have about multiplication and comparative sizes and such. Mathematicians needed to get comfortable with negative numbers. For a long time, for example, mathematicians would treat and as different kinds of polynomials to solve. Today we see a -4 as no harder than a +4, now that we’re good at multiplying it out. And I have read, but have not seen explained, that there was uncertainty among the philosophers of mathematics about whether we should consider negative numbers, as a group, to be greater than or less than positive numbers. (I have reasons for thinking this a mighty interesting speculation.) There’s reasons to doubt them, is what I have to say. Jef Mallet’s Frazz for the 22nd of October, 2018. Good thing to learn, really. Bob Weber Jr and Jay Stephens’s Oh Brother for the 22nd reminds me of my childhood. At some point I was pairing up the counting numbers and the letters of the alphabet, and realized that the alphabet ended while the numbers did not. Something about that offended my young sense of justice. I’m not sure how, anymore. But that it was always possible to find a bigger number than whatever you thought was the biggest caught my imagination. Bob Weber Jr and Jay Stephens’s Oh Brother for the 22nd of October, 2018. This may be a rerun; I don’t know if the strip is still in original production. There is, surely, a largest finite number that anybody will ever use for something, even if it’s just hyperbole. I’m curious what it will be. Surely we can’t have already used it. A number named Skewes’s Number was famous, for a while, as the largest number actually used in a proof of something. The fame came from Isaac Asimov writing an essay about the number, and why someone might care, and how hard it is just describing how big the number is in a comprehensible way. Wikipedia tells me this number’s far been exceeded by, among other things, something called Rayo’s Number. It’s “the smallest number bigger than any finite number named by an expression in the language of set theory with a googol symbols or less” (plus some technical points to keep you from cheating). Which, all right, but I’d like to know if we think the first digit is a 1, maybe a 2? Somehow I don’t demand that of Skewes, perhaps because I read that Asimov essay when I was at an impressionable age. Jef Mallet’s Frazz for the 23rd of October, 2018. I appreciate when Mrs Olsen is given the chance to show she does know things. Jef Mallet’s Frazz for the 23rd has Caulfield talk about a fraction divided by a fraction. And particularly he says “a fraction divided by a fraction is just a fraction times a flipped fraction”. This offends me, somehow. This even though that is how I’d calculate the value of the division, if I needed to know that. But it seems to me like automatically going to that process skips recognizing that, say, shouldn’t be surprising if it turns out not to be a fraction. Well, Caulfield’s just looking to cause trouble with a string of wordplay. I can think of how to divide a fraction by a fraction and get zero. Ashleigh Brilliant’s Pot-Shots for the 23rd of October, 2018. This is a rerun, but from 1977; the strip is not in regular production anymore. Ashleigh Brilliant’s Pot-Shots for the 23rd promises to recapitulate the whole history of mathematics in a single panel. Ambitious bit of work. It’s easy to picture going from the idea of 1 to any of the positive whole numbers, though. It’s so easy it doesn’t even need humans to do it; animals can count, at least a bit. We just carry on to a greater extent than the crows or the raccoons do, so far as we’ve heard. From those, it takes some squinting, but you can think of negative whole numbers. And from that you get zero pretty quickly. You can also get rational numbers. The western mathematical tradition did this by looking at … er … ratios, that something might be to another thing as two is to five. Circumlocutions like that. Getting to irrational numbers is harder. Can be harder. Some irrational numbers beg you to notice them: the square root of two, for example. Square root of three. Numbers that come up from solving polynomial equations. But there are more number than those. Many more numbers. You might suspect the existence of a transcendental number, that isn’t the root of any polynomial that’s decently behaved. But finding one? Or finding that there are more transcendental number than there are real numbers? This takes a certain brilliance to suspect, and to prove out. But we can get there with rational numbers — which we get to from collections of ones — and the idea of cutting sets of numbers into those smaller than and those bigger than something. Ashleigh Brilliant has more truth than, perhaps, he realized when he drew this panel. Niklas Eriksson’s Carpe Diem for the 24th of October, 2018. I’m curious how the ground is accounted for. Niklas Eriksson’s Carpe Diem for the 24th has goldfish work out the shape of space. A goldfish in this case has the advantage of being able to go nearly everywhere in the space. But working out what the universe must look like, when you can only run local experiments, is a great geometric problem. It’s akin to working out that the Earth must be a sphere, and about how big a sphere, from the surveying job one can do without travelling more than a few hundred kilometers. If you’re interested in reading the comics, you might want to see Reading the Comics posts. They’re here. More essays mentioning Frazz should be at this link. Essays that discuss ideas brought up by Oh Brother! should be this link. Essays which talk about Frazz — wait. I said that. This and other appearances by Pot Shots should be at this link. And posts which feature Carpe Diem should be at link. Do please stick around for more of my Fall 2018 Mathematics A-To-Z, too. I’m trying to keep up at two essays a week through the end of the year, which is not precisely fall. And for another week running the pace of mathematically-themed comic strips has been near normal. There’s nowhere near enough to split the essay into two pieces, which is fine. There is some more work involved in including images for all the strips I discuss and this pace better fits the time I could make for writing this week. Will admit I’m scared of what’s going to happen when I have a busy week and Comic Strip Master Command orders more comics for me. I admit this isn’t an inspired name for the Edition. But the edition names are mostly there so people have a chance of telling whether they’ve read an installment before. The date alone doesn’t do it. A couple of words will. Maybe I should give up on meaningful names if there isn’t an obvious theme for the week. It’s got to be at least as good to name something “Coronet Blue Edition” as to name it “Lots Of Andertoons Edition”. Frank Cho’s Liberty Meadows rerun for the 1st of April, 2018. First, good cameo. Second, this rerun’s being from around 2000 means quantum computers have been fit subjects for newspaper jokes about two decades now, and I didn’t realize that. And yeah, in the penultimate panel Cho says ‘with apologies and respect to V T Hamlin. (Hamlin created Alley Oop , and you can read my thoughts about the current strip on this link.) Cartoonists always write ‘apologies to’ when they use another artist’s characters and I don’t know how the convention started. Certainly not for cameos like this where it’s not like Oop does something that could damage his character. Niklas Eriksson’s Carpe Diem for the 2nd is a mathematics-education-these-days joke. The extremely small child talking about counting-without-a-calculator as a subject worth studying. People are always complaining that people don’t do arithmetic well enough in their heads. I understand the frustration, considering last week I stymied a cashier at a Penn Station by giving $22.11 for my $11.61 order. I don’t know why he put in my payment as $20; why not let the machine designed to do this work, do the work? He did fine working out that I should get $10 in bills back but muddled up the change. As annoyances go it ranks up there with the fast food cashier asking my name for the order and entering it as “Joeseph”. Niklas Eriksson’s Carpe Diem for the 2nd of April, 2018. I’m kind of distracted trying to work out the perspective between the kid and the adult. Either the kid’s standing pretty far away or is really tiny and is standing on a chair. Lard’s World Peace Tips for the 4th mentions the Möbius Strip. It’s got to be the most famous exotic piece of geometry to have penetrated the popular culture. It’s also a good shape to introduce geometry students to a “non-orientable” surface. Non-orientable means about what you’d imagine. There’s not a way to put coordinates on it that don’t get weird. For example, try drawing an equator on the surface of the strip. Any curve along the surface that doesn’t run off the edges will do. The curve just has to meet itself. It looks like this divides the strip into two pieces. Fine, then; which of these two pieces is “north” and which is “south” of this equator? There’s not a way to do that. You get surprising results if you try. Lard’s World Peace Tips for the 4th of April, 2018. Until transcribing the strip for the alt-text here I didn’t realize it was a chicken, and not Lard, being chased in that final panel. Dan Thompson’s Brevity for the 6th is some mathematics wordplay, built on the abacus. I’m not sure there’s more to say about this, past that you can do much more on an abacus. You can, at least. I keep reading directions about how to multiply with it and then I look at mine and I feel helpless. Dan Thompson’s Brevity for the 6th of April, 2018. My father’s trained me to be skeptical of granite counters, although I don’t remember why. In any case in our kitchen we’re keeping the counter as is, to respect the history of a house that’s nine decades old this year and that we hope to be in when it reaches its centennial. And because we like ourselves too much to inflict countertop-replacement work on us. Bil Keane and Jeff Keane’s Family Circus for the 7th is a kids-mispronouncing-a-mathematics-word strip. I have even less to say about this. It’s a normal week. Bil Keane and Jeff Keane’s Family Circus for the 7th of April, 2018. This is probably a rerun; most Family Circus strips are these days. No idea when from exactly; most of the identifiable reruns have been from the 70s. Also, so far as this goes, she isn’t demonstrating problems with eaglity. 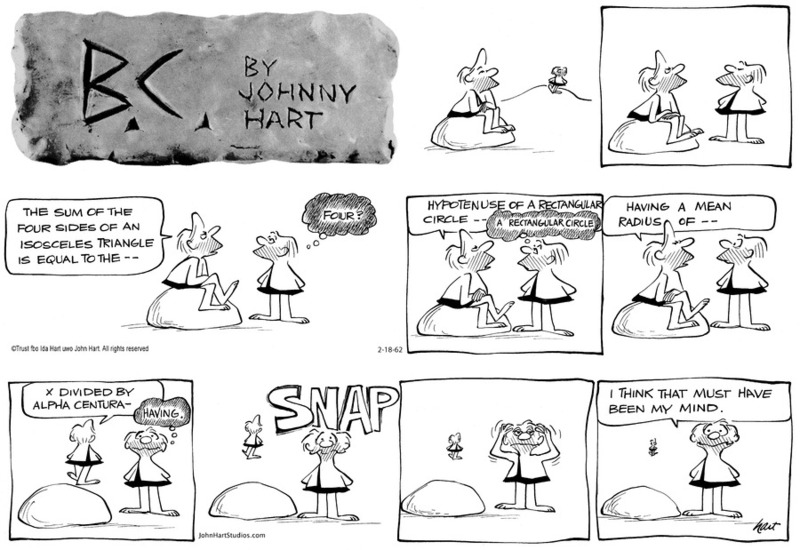 I had just enough comic strips to split this week’s mathematics comics review into two pieces. I like that. It feels so much to me like I have better readership when I have many days in a row with posting something, however slight. The A to Z is good for three days a week, and if comic strips can fill two of those other days then I get to enjoy a lot of regular publication days. … Though last week I accidentally set the Sunday comics post to appear on Monday, just before the A To Z post. I’m curious how that affected my readers. That nobody said anything is ominous. Niklas Eriksson’s Carpe Diem for the 7th of August, 2017. I have to agree the border collies haven’t worked out the point of fetch. I also question whether they’ve worked out the simple ballistics of the tossed stick. If the variables mean what they suggest they mean, then dimensional analysis suggests they’ve got at least three fiascos going on here. Maybe they have an idiosyncratic use for variables like ‘v’. Nicole Hollander’s Sylvia rerun for the 7th tosses off a mention that “we’re the first generation of girls who do math”. And that therefore there will be a cornucopia of new opportunities and good things to come to them. There’s a bunch of social commentary in there. One is the assumption that mathematics skill is a liberating thing. Perhaps it is the gloom of the times but I doubt that an oppressed group developing skills causes them to be esteemed. It seems more likely to me to make the skills become devalued. Social justice isn’t a matter of good exam grades. Then, too, it’s not as though women haven’t done mathematics since forever. Every mathematics department on a college campus has some faded posters about Emmy Noether and Sofia Kovalevskaya and maybe Sophie Germaine. Probably high school mathematics rooms too. Again perhaps it’s the gloom of the times. But I keep coming back to the goddess’s cynical dismissal of all this young hope. Mort Walker and Dik Browne’s Hi and Lois for the 10th of February, 1960 and rerun the 8th portrays arithmetic as a grand-strategic imperative. Well, it means education as a strategic imperative. But arithmetic is the thing Dot uses. I imagine because it is so easy to teach as a series of trivia and quiz about. And it fits in a single panel with room to spare. Mort Walker and Dik Browne’s Hi and Lois for the 10th of February, 1960 and rerun the 8th of August, 2017. Remember: you’re only young once, but you can be geopolitically naive forever! Paul Trap’s Thatababy for the 8th is not quite the anthropomorphic-numerals joke of the week. It circles around that territory, though, giving a couple of odd numbers some personality. Brian Anderson’s Dog Eat Doug for the 9th finally justifies my title for this essay, as cats ponder mathematics. Well, they ponder quantum mechanics. But it’s nearly impossible to have a serious thought about that without pondering its mathematics. This doesn’t mean calculation, mind you. It does mean understanding what kinds of functions have physical importance. And what kinds of things one can do to functions. Understand them and you can discuss quantum mechanics without being mathematically stupid. And there’s enough ways to be stupid about quantum mechanics that any you can cut down is progress. I’m not sure there is an overarching theme to the past week’s gifts from Comic Strip Master Command. If there is, it’s that I feel like some strips are making cranky points and I want to argue against their cases. I’m not sure what the opposite of a curmudgeon is. So I shall dub myself, pending a better idea, a counter-mudgeon. This won’t last, as it’s not really a good name, but there must be a better one somewhere. We’ll see it, now that I’ve said I don’t know what it is. Niklas Eriksson’s Carpe Diem for the 17th of July, 2017. First, if anyone isn’t thinking of that Pixar short then I’m not sure we can really understand each other. Second, ‘von Thump’ is a fine name for a bunny scientist and if it wasn’t ever used in the rich lore of Usenet group alt.devilbunnies I shall be disappointed. Third, Eriksson made an understandable but unfortunate mistake in composing this panel. While both rabbits are wearing glasses, they’re facing away from the viewer. It’s always correct to draw animals wearing eyeglasses, or to photograph them so. But we should get to see them in full eyeglass pelage. You’d think they would teach that in Cartoonist School or something. Niklas Eriksson’s Carpe Diem for the 17th features the blackboard full of equations as icon for serious, deep mathematical work. It also features rabbits, although probably not for their role in shaping mathematical thinking. Rabbits and their breeding were used in the simple toy model that gave us Fibonacci numbers, famously. And the population of Arctic hares gives those of us who’ve reached differential equations a great problem to do. The ecosystem in which Arctic hares live can be modelled very simply, as hares and a generic predator. We can model how the populations of both grow with simple equations that nevertheless give us surprises. In a rich, diverse ecosystem we see a lot of population stability: one year where an animal is a little more fecund than usual doesn’t matter much. In the sparse ecosystem of the Arctic, and the one we’re building worldwide, small changes can have matter enormously. We can even produce deterministic chaos, in which if we knew exactly how many hares and predators there were, and exactly how many of them would be born and exactly how many would die, we could predict future populations. But the tiny difference between our attainable estimate and the reality, even if it’s as small as one hare too many or too few in our model, makes our predictions worthless. It’s thrilling stuff. Vic Lee’s Pardon My Planet for the 17th reads, to me, as a word problem joke. The talk about how much change Marian should get back from Blake could be any kind of minor hassle in the real world where one friend covers the cost of something for another but expects to be repaid. But counting how many more nickels one person has than another? That’s of interest to kids and to story-problem authors. Who else worries about that count? Vic Lee’s Pardon My Planet for the 17th of July, 2017. I am surprised she had no questions about how many dimes Jonathan must have, although perhaps that will follow obviously from knowing the Beth nickel situation. Jef Mallet’s Frazz for the 17th straddles that triple point joining mathematics, philosophy, and economics. It seems sensible, in an age that embraces the idea that everything can be measured, to try to quantify happiness. And it seems sensible, in age that embraces the idea that we can model and extrapolate and act on reasonable projections, to try to see what might improve our happiness. This is so even if it’s as simple as identifying what we should or shouldn’t be happy about. Caulfield is circling around the discovery of utilitarianism. It’s a philosophy that (for my money) is better-suited to problems like how ought the city arrange its bus lines than matters too integral to life. But it, too, can bring comfort. Corey Pandolph’s Barkeater Lake rerun for the 20th features some mischievous arithmetic. I’m amused. It turns out that people do have enough of a number sense that very few people would let “17 plus 79 is 4,178” pass without comment. People might not be able to say exactly what it is, on a glance. If you answered that 17 plus 79 was 95, or 102, most people would need to stop and think about whether either was right. But they’re likely to know without thinking that it can’t be, say, 56 or 206. This, I understand, is so even for people who aren’t good at arithmetic. There is something amazing that we can do this sort of arithmetic so well, considering that there’s little obvious in the natural world that would need the human animal to add 17 and 79. There are things about how animals understand numbers which we don’t know yet. Alex Hallatt’s Human Cull for the 21st seems almost a direct response to the Barkeater Lake rerun. Somehow “making change” is treated as the highest calling of mathematics. I suppose it has a fair claim to the title of mathematics most often done. Still, I can’t get behind Hallatt’s crankiness here, and not just because Human Cull is one of the most needlessly curmudgeonly strips I regularly read. For one, store clerks don’t need to do mathematics. The cash registers do all the mathematics that clerks might need to do, and do it very well. The machines are cheap, fast, and reliable. Not using them is an affectation. I’ll grant it gives some charm to antiques shops and boutiques where they write your receipt out by hand, but that’s for atmosphere, not reliability. And it is useful the clerk having a rough idea what the change should be. But that’s just to avoid the risk of mistakes getting through. No matter how mathematically skilled the clerk is, there’ll sometimes be a price entered wrong, or the customer’s money counted wrong, or a one-dollar bill put in the five-dollar bill’s tray, or a clerk picking up two nickels when three would have been more appropriate. We should have empathy for the people doing this work. Comic Strip Master Command just barely missed being busy enough for me to split the week’s edition. Fine for them, I suppose, although it means I’m going to have to scramble together something for the Tuesday or the Thursday posting slot. Ah well. As befits the comics, there’s a fair bit of mathematics as an icon in the past week’s selections. So let’s discuss. Mark Anderson’s Andertoons for the 11th is our Mark Anderson’s Andertoons for this essay. Kind of a relief to have that in right away. And while the cartoon shows a real disaster of a student at the chalkboard, there is some truth to the caption. Ruling out plausible-looking wrong answers is progress, usually. So is coming up with plausible-looking answers to work out whether they’re right or wrong. The troubling part here, I’d say, is that the kid came up with pretty poor guesses about what the answer might be. He ought to be able to guess that it’s got to be an odd number, and has to be less than 10, and really ought to be less than 7. If you spot that then you can’t make more than two wrong guesses. Patrick J Marrin’s Francis for the 12th starts with what sounds like a logical paradox, about whether the Pope could make an infallibly true statement that he was not infallible. Really it sounds like a bit of nonsense. But the limits of what we can know about a logical system will often involve questions of this form. We ask whether something can prove whether it is provable, for example, and come up with a rigorous answer. So that’s the mathematical content which justifies my including this strip here. Niklas Eriksson’s Carpe Diem for the 13th of June, 2017. Yes, yes, it’s easy to get people excited for the Revolution, but it’ll come to a halt when someone asks about how they get the groceries afterwards. Niklas Eriksson’s Carpe Diem for the 13th is a traditional use of the blackboard full of mathematics as symbolic of intelligence. Of course ‘E = mc2‘ gets in there. I’m surprised that both π and 3.14 do, too, for as little as we see on the board. Mark Anderson’s Andertoons for the 14th is a nice bit of reassurance. Maybe the cartoonist was worried this would be a split-week edition. The kid seems to be the same one as the 11th, but the teacher looks different. Anyway there’s a lot you can tell about shapes from their perimeter alone. The one which most startles me comes up in calculus: by doing the right calculation about the lengths and directions of the edge of a shape you can tell how much area is inside the shape. There’s a lot of stuff in this field — multivariable calculus — that’s about swapping between “stuff you know about the boundary of a shape” and “stuff you know about the interior of the shape”. And finding area from tracing the boundary is one of them. It’s still glorious. Samson’s Dark Side Of The Horse for the 14th is a counting-sheep joke and a Pi Day joke. I suspect the digits of π would be horrible for lulling one to sleep, though. They lack the just-enough-order that something needs for a semiconscious mind to drift off. Horace would probably be better off working out Collatz sequences. Dana Simpson’s Phoebe and her Unicorn for the 14th mentions mathematics as iconic of what you do at school. Book reports also make the cut. Dan Barry’s Flash Gordon for the 31st of July, 1962, rerun the 16th of June, 2017. I am impressed that Dr Zarkov can make a TV set capable of viewing alternate universes. I still literally do not know how it is possible that we have sound for our new TV set, and I labelled and connected every single wire in the thing. Oh, wouldn’t it be a kick if Dr Zarkov has the picture from one alternate universe but the sound from a slightly different other one? It’s too many comics to call this a famine edition, after last week’s feast. But there’s not a lot of theme to last week’s mathematically-themed comic strips. There’s a couple that include vintage comic strips from before 1940, though, so let’s run with that as a title. Glenn McCoy and Gary McCoy’s The Flying McCoys for the 4th of June is your traditional blackboard full of symbols to indicate serious and deep thought on a subject. It’s a silly subject, but that’s fine. The symbols look to me gibberish, but clown research will go along non-traditional paths, I suppose. Bill Hinds’s Tank McNamara for the 4th is built on mathematics’ successful invasion and colonization of sports management. Analytics, sabermetrics, Moneyball, whatever you want to call it, is built on ideas not far removed from the quality control techniques that changed corporate management so. Look for patterns; look for correlations; look for the things that seem to predict other things. It seems bizarre, almost inhuman, that we might be able to think of football players as being all of a kind, that what we know about (say) one running back will tell us something about another. But if we put roughly similarly capable people through roughly similar training and set them to work in roughly similar conditions, then we start to see why they might perform similarly. Models can help us make better, more rational, choices. Morrie Turner’s Wee Pals rerun for the 4th is another word-problem resistance joke. I suppose it’s also a reminder about the unspoken assumptions in a problem. It also points out why mathematicians end up speaking in an annoyingly precise manner. It’s an attempt to avoid being shown up like Oliver is. Which wouldn’t help with Percy Crosby’s Skippy for the 7th of April, 1930, and rerun the 5th. Skippy’s got a smooth line of patter to get out of his mother’s tutoring. You can see where Percy Crosby has the weird trait of drawing comics in 1930 that would make sense today still; few pre-World-War-II comics do. Niklas Eriksson’s Carpe Diem for the 7th of June, 2017. If I may intrude in someone else’s work, it seems to me that the problem-solver might find a hint to what ‘x’ is by looking to the upper right corner of the page and the already there. Niklas Eriksson’s Carpe Diem for the 7th is a joke about mathematics anxiety. I don’t know that it actually explains anything, but, eh. I’m not sure there is a rational explanation for mathematics anxiety; if there were, I suppose it wouldn’t be anxiety. George Herriman’s Krazy Kat for the 15th of July, 1939, and rerun the 8th, extends that odd little faintly word-problem-setup of the strips I mentioned the other day. I suppose identifying when two things moving at different speeds will intersect will always sound vaguely like a story problem. George Herriman’s Krazy Kat for the 15th of July, 1939, as rerun the 8th of June, 2017. I know the comic isn’t to everyone’s taste, but I like it. I’m also surprised to see something as directly cartoonish as the brick stopping in midair like that in the third panel. The comic is usually surreal, yes, but not that way. Tom Toles’s Randolph Itch, 2 am rerun for the 9th is about the sometimes-considered third possibility from a fair coin toss, and how to rig the results of that.